The top individual scorer in last week's quiz was Sophie Jamieson with 15.5, narrowly defeating Alex Murphy on 15. Multiple winner from previous quizzes, Lydia Willgress, weighed in with 14. The top team scores went to the Batstone Collective with 16, the same score as Alan MacDermid and Janet Boyle. My pub pals in the Plough, led by Nicky Castell, clocked up 13. Here's this week's quiz ... as usual 25 points up for grabs. Let me know how you get on. 1. The US Attorney General said Fifa officials had allegedly run a 'rampant, systemic and deep-rooted' scheme to 'acquire millions of dollars in bribes and kickbacks'. Who is the US Attorney General? Bonus: Who surrendered to police in Trinidad after an arrest warrant was issued at the request of US authorities? 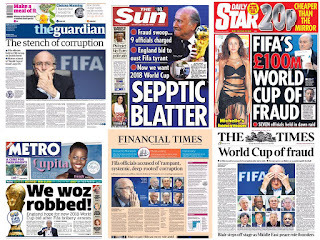 Bonus: Which company issued a statement saying that should FIFA fail to make changes, 'we have informed them that we will reassess our sponsorship.’? 2. In the Queen’s Speech it was announced that there would be an 'in-out' referendum on membership of the European Union before the end of which year? Bonus: Legislation will also be introduced to ensure the maximum a household can receive in benefits a year will be how much? Bonus: Scottish National MPs were warned to 'show some respect' after continuously breaking Parliamentary protocol. What did they do? 3. Why was Jeffrey Spector in the headlines? 4. Jed Allen is believed to have killed three members of his family at their home in which town? 5. Who ran on to the Wembley pitch and punched the air while wearing high heels, a black trouser suit and pearl earrings? 6. What has Pope Francis not done since 1990 after making a promise to the Virgin Mary? 7. Members of the UCG brought parts of London to a standstill on Monday. What does UCG stand for? 8. How did the Beckham family spend Bank Holiday Monday afternoon? 9. Annegret Raunigk, 65, became the oldest woman to do what? 10. The three Queens - Mary, Victoria and Elizabeth - put on a spectacular show on which river? 11. Scientists from Stockholm’s Karolinska Institute published research showing that people living near a motorway or under a flight path are 25 per cent more likely to be what? 12. Who became the youngest person ever to be included on Forbes most powerful women list? Bonus: Who was Number 1 on the list for the fifth year running? 13. International Airlines Group, the parent company of British Airways, is planning a £990m takeover of which company? 14. Australian Trevor Bayliss has been named as the new what? 15. The BBC announced it was pulling the plug on which show after 18 years and 28 series? 16. How did Danish DJ Asger Juhl cause a stir live on radio? 17. Prince William told Gary Lineker of his plans to do something but said he would have to 'pass it by the missus'. What is the prince planning? 18. What has killed almost 1,000 people in the Southern Indian state of Andhra Pradesh in the last fortnight? 19. Respect party leader George Galloway announced on Twitter that he is to seek election for what position? 20. A joint study by Radio 2 and Oxford University has declared what as the word of the year for children? Is your front page blurb doing its job? Since the mid-80s every newspaper has regularly carried a blurb, skybox, boost, puff panel, teaser (call it what you will) on its front page. Why? 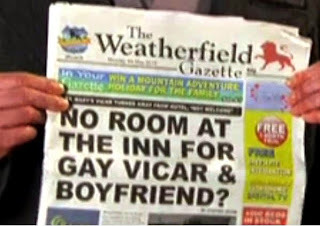 Well, its real, and only, purpose is to sell the paper. But, as one publisher asked me recently, does it work? And if it doesn't could we make better use of the space? 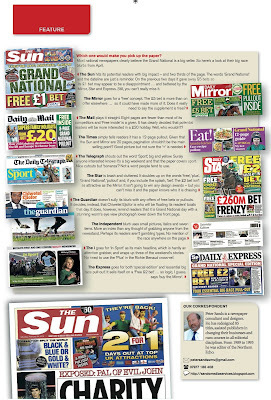 Here are my do's and don'ts for the front page blurb, published in this month's InPublishing magazine. The top individual scorers in last week's newsquiz were James Restall and Alexander Smith both with 15. Alex Murphy scored 14, Chris Lennon 13, and Blaise Tapp 12.5. The best team effort was 17 - scored by Neil Benson's family and by Janet Boyle and husband Alan MacDermid. The Batstone Collective (Adam and Lucy) were stuck on 13, same as last week. Here's this week's quiz - the usual 20 questions with five bonuses - a total of 25 points up for grabs. Let me know how you get on. 1. Who said he could not be confident of enough support from fellow MPs to launch a bid for the Labour leadership? 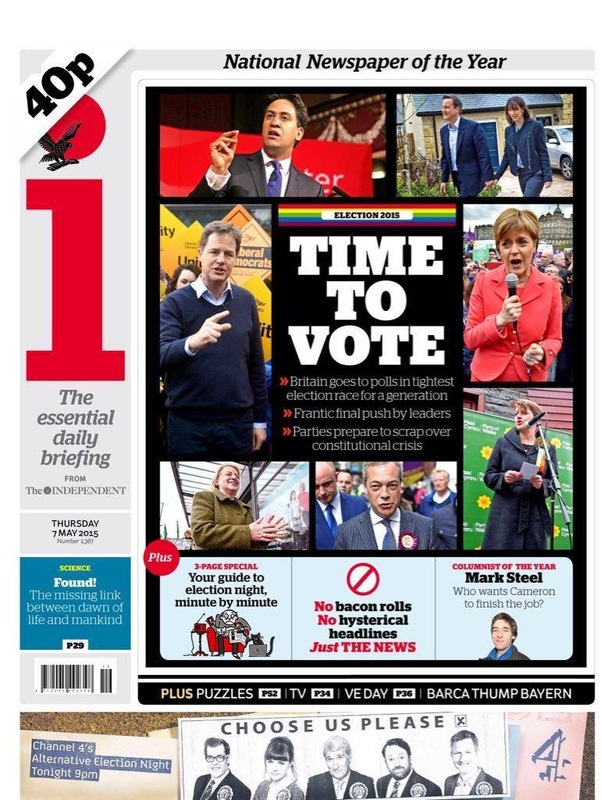 Bonus: Candidates must get support from how many Labour MPs to be able to launch a leadership bid? 2. Prince Charles shook hands with Sinn Fein leader Gerry Adams at the National University of Ireland, in which city? Bonus: Prince Charles visited the village of Mullaghmore where his great-uncle Earl Mountbatten was murdered. 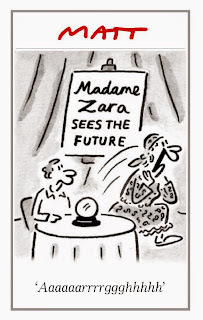 What year was Mountbatten killed? 3. The Eurovision Song Contest is being held in which city? Bonus: What is the name of UK entry that will be sung by Electro Velvet? 4. Why was the Ashers Baking Company ordered to pay £500 in damages? 5. Britain's biggest earthquake for seven years shook Kent this morning (Friday). According to the British Geological Survey what was its magnitude? 6. Barclays Bank was fined how much for colluding to manipulate foreign exchange markets? 7. Six snipers, 20 squad vehicles and dozens of police officers gave chase in an incident on Tyneside which led to the death of who? 8. Why were Brian Reeder, 76, and his 50-year-old son Paul in the headlines? 9. Islamic State militants in Syria have entered a Unesco World Heritage site and there are fears they will begin destroying the ancient ruins. What is the site called? Bonus: IS released a propaganda video showing a young man tied to a post in Syrian province Deir Ezzorin and being executed with what weapon? 10. Which company agreed to demolish a bungalow and turn it into a playground? 11. What linked actress Sadie Frost, ex-footballer Paul Gascoigne, BBC executive Alan Yentob and flight attendant Lauren Alcorn? 12. Twerking, emoji, bezzy, lolz, shizzle and ridic were among 6,500 words added to what? 13. What rose by 50 percent last year to a figure of 318,000 - its highest for a decade? 14. Who said: 'When you learn how the world works, you can start to work out what to do. In the meantime I'm getting really good at tennis. My forehand has improved immeasurably.’? 15. Football agent Aidy Ward said his client would not be staying even if he was offered ‘£700, £800 or £900,000 a week.’ Who was he talking about? Bonus: Which two teams meet at Wembley on Monday to compete for the final place in the Premier League? Half point for each. 16. 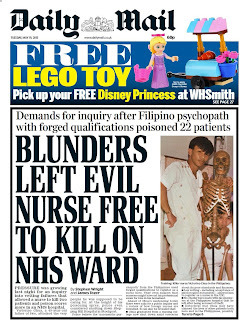 Victorino Chua killed two patients and poisoned 20 others by injecting deadly levels of insulin into saline bags while working in Stepping Hill Hospital in which town? 17. Which company announced plans to cut up to 1,600 jobs across 12 sites by September next year? 18. Ireland is the first country to use a national referendum to decide what? 19. Film producer Valeria Richter claimed she was turned away from the red carpet at the Cannes Film Festival for what reason? 20. According to NHS data, men who drink one or two mugs of coffee a day are less likely to suffer from what? Sue Ryan and I had a very rewarding day on Thursday, meeting the candidates for the Stephen Lawrence scholarships at the Daily Mail. They all had a tour of the newsroom with chief reporter David Williams, met former trainees, had a good round-the-table discussion about the day's news and an enjoyable lunch. The Mail is offering two trainees a position on its training scheme, with a view to them getting a full-time job in the newsroom. 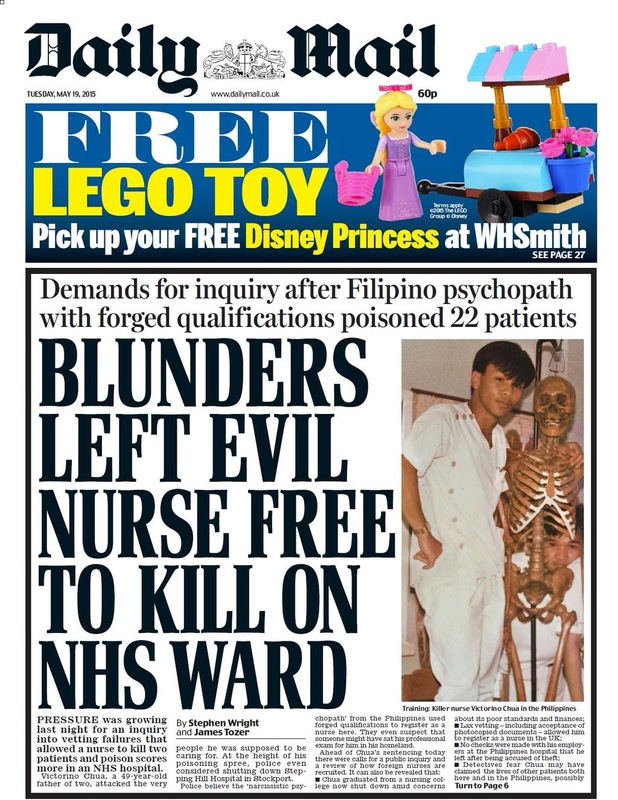 The Mail has long-supported the family of Stephen, who was murdered at 18 in 1993. The shortlisted candidates will meet Stephen's mother, Doreen (now Baroness Lawrence of Clarendon). Good luck to all of them. 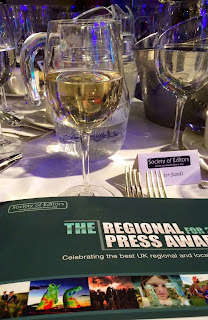 The Regional Press Awards were certainly dramatic on Friday. Just as we were tucking into the main course at the Marriott in Grosvenor Square the fire alarms went off and we were all evacuated. We stood for half an hour or so in the park (I was impressed that host Nick Ferrari brought his glass of wine) before being led to another hotel, the Grosvenor, for a glass of Champagne. Bob Satchwell (dubbed Capt Mainwaring by Ferrari) aided by an urbane Sgt Wilson (Paul Horrocks) then told us we were heading back to the Marriott. Apparently a faulty machine had spread smoke throughout the building. Lunch was ruined … but the hotel put on a free bar and the awards continued. Ferrari presented them at breakneck speed so that those who had trains to the far flung corners could get home before midnight. The incident shouldn’t really deflect from the achievements of the day though. 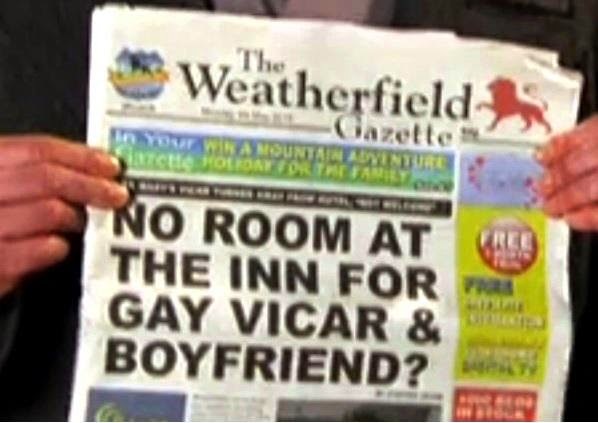 Regional newspapers may be going through a challenging time - but there is some first class work out there. 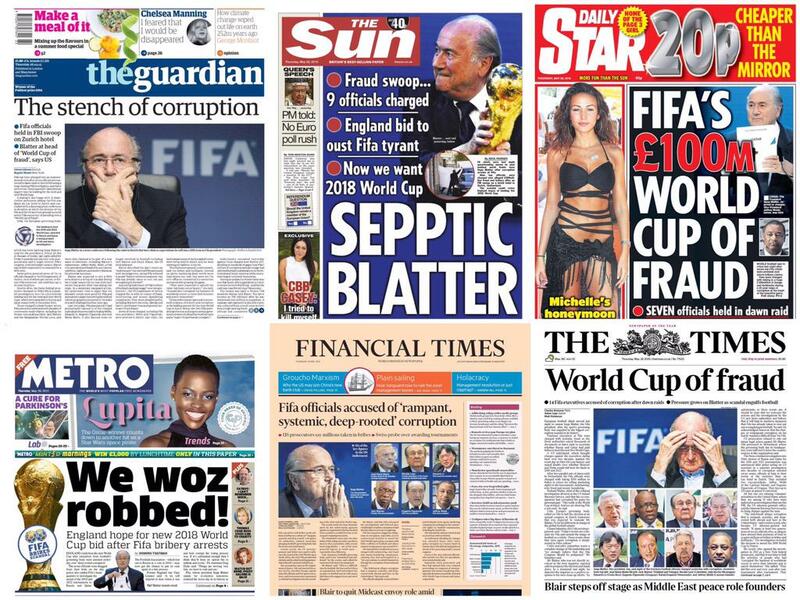 The standard is as high as ever and there is real evidence of an investment in quality journalism. It was, as always, a great day and a chance to catch up with some (increasingly) old faces. Anyway, here are my ten musings about the day. 1. 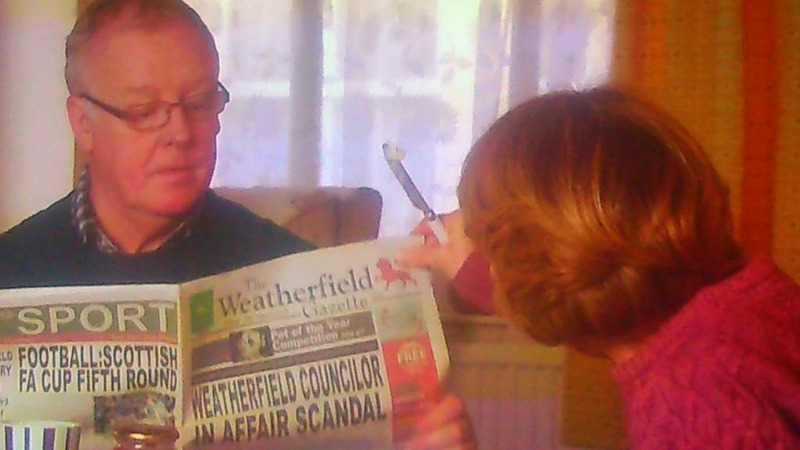 Trinity Mirror, especially the Birmingham Mail and Sunday Life were the big winners. Sunday Life collected four winners’ medals including daily/Sunday Newspaper of the Year with a circulation of more than 25,000 and the Make A Difference campaign. 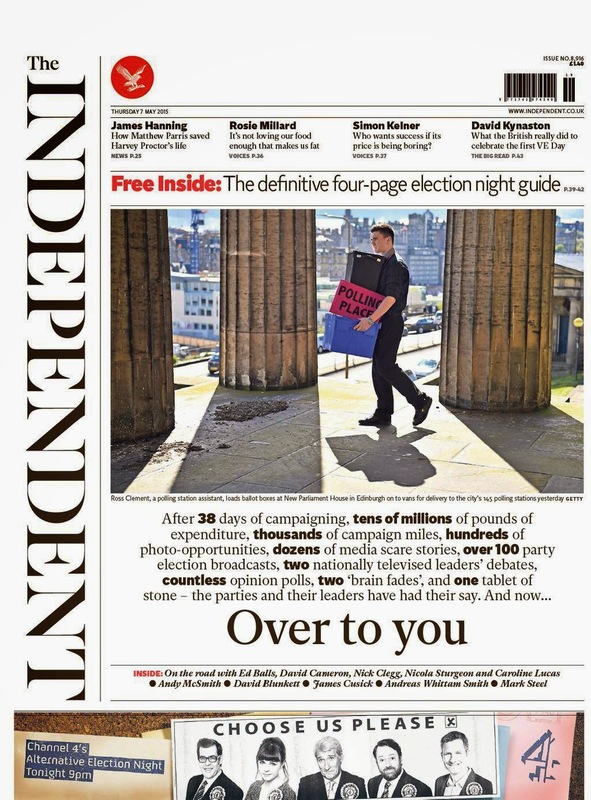 The paper is part of Independent News and Media who I worked with most of last year. 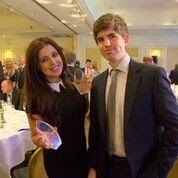 It is a group that really invests in journalism and its journalists and it certainly paid dividends at the awards. Trinity Mirror was the biggest group winner with 8 awards and 5 commended. The Birmingham Mail collected four of Trinity's top awards. 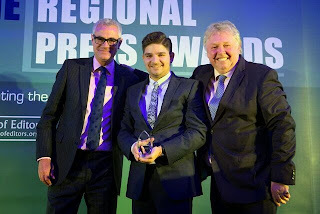 Local World had 4 winners (5 commended) and Cumbria Newspapers won 2 (3 commended). 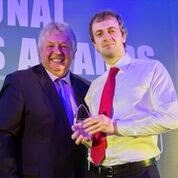 Newsquest won 1 and was commended 7 times. 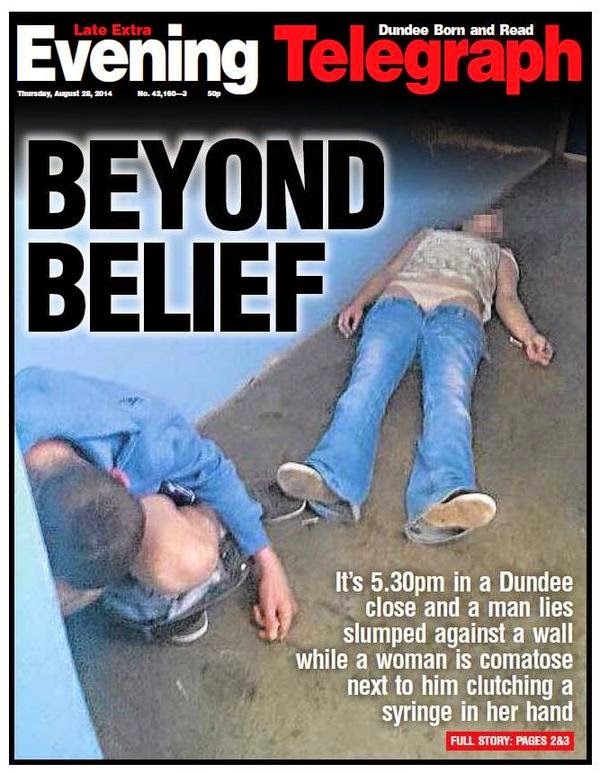 Johnston Press (2 commended), DC Thomson (3 commended) and Tindle (no commended) also won 1 top award. 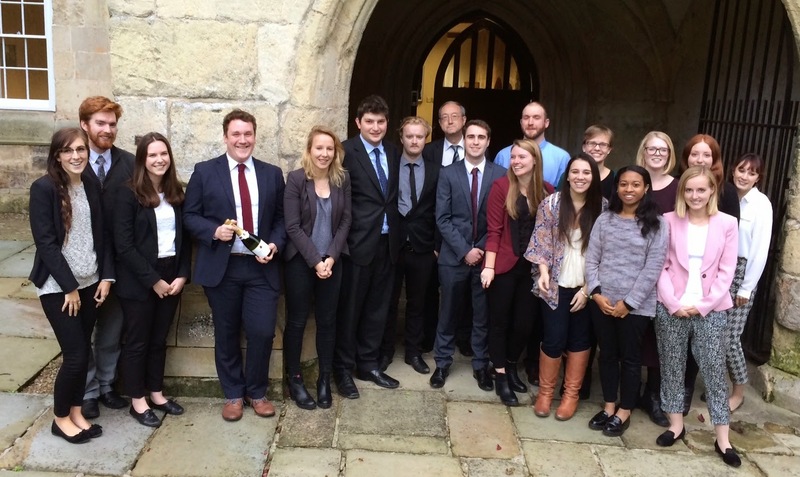 The KM group and Archant titles were both commended once. 2. 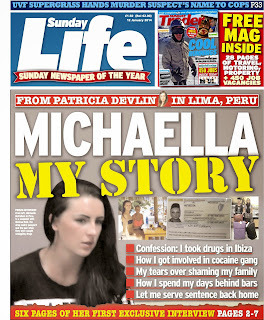 Sunday Life's Patricia Devlin took two big individual awards ... best daily/Sunday reporter and Scoop of the Year. 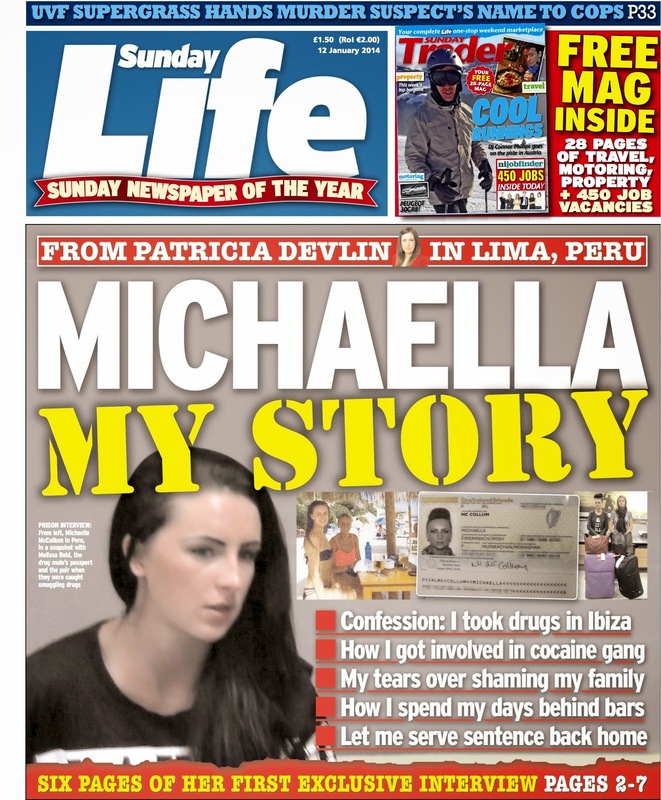 She had a first class portfolio, the cream of which was the six-page interview with drugs mule Michaella McCollum in a Peruvian jail. Patricia managed to get the interview even though journalists were banned from the prison. Great work. But a special mention should go to her editor Martin Breen. How many regional editors these days would find money in their budget to send a reporter out to Peru on the off-chance of a story? 3. 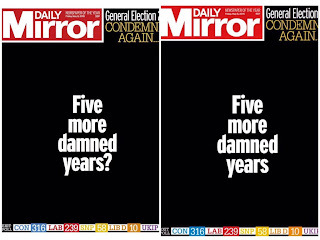 Trinity Mirror quite rightly dominated the digital nominations with five titles shortlisted. 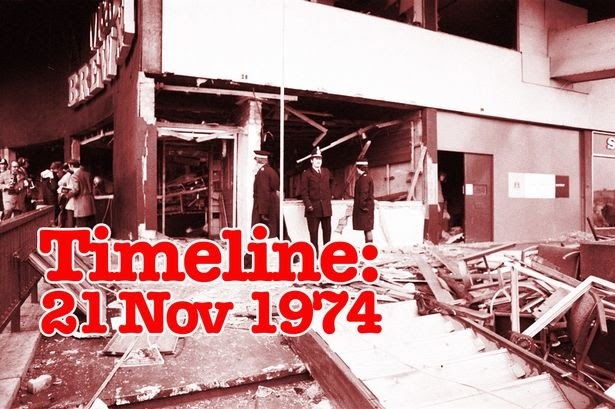 It was difficult to separate the Evening Chronicle for its Great North Run Million and the Birmingham Mail’s coverage of the anniversary of the pub bombings. Both were outstanding. 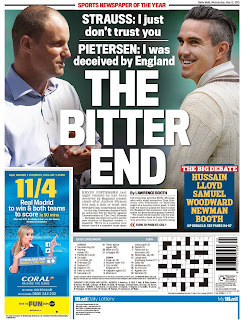 The Mail edged it but either would have been worthy winners. The Mail also won Website of the Year. Trinity’s investment in digital first coverage really shows - and it is setting a standard for the rest of the regional industry. 4. 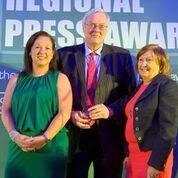 One of the last great newspaper proprietors Robin Burgess, who has been the main man at Cumbria Newspapers for 30 years, was the deserved recipient of the Journalists' Charity Award for making an outstanding contribution to the industry. He is literally one of the newspaper industry’s big men who has always supported good journalism and journalists. The good news is, although he is retiring as chief executive in January, he will stay on as non-executive chairman, continuing to fight the good fight. 5. Front Page of the Year showcased some first rate designs and stories that proved the regional press is still alive and kicking. 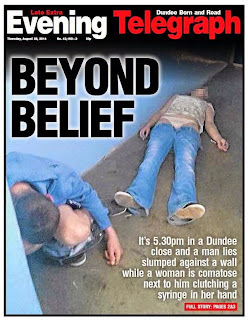 All six could have won it but I particularly liked the winner, the Evening Telegraph in Dundee, not least as it was a genuine news page rather than a set piece. 6. 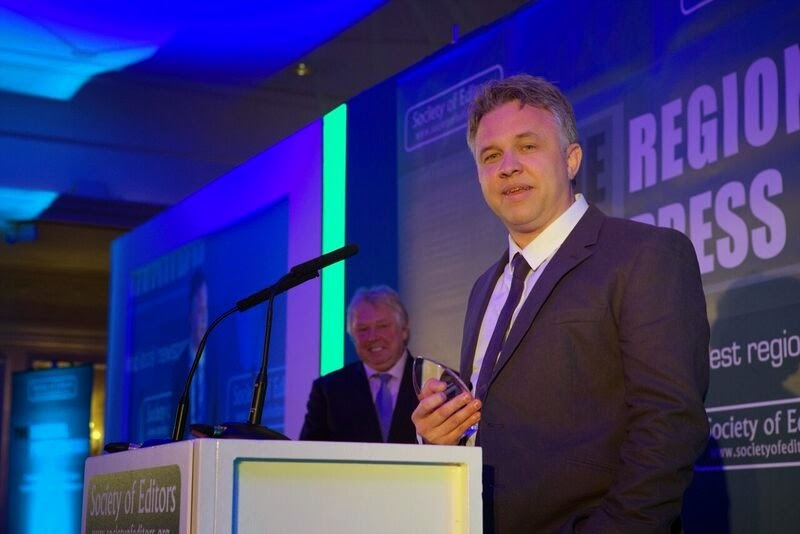 It was good to see my former colleagues in Local World picking up their awards. 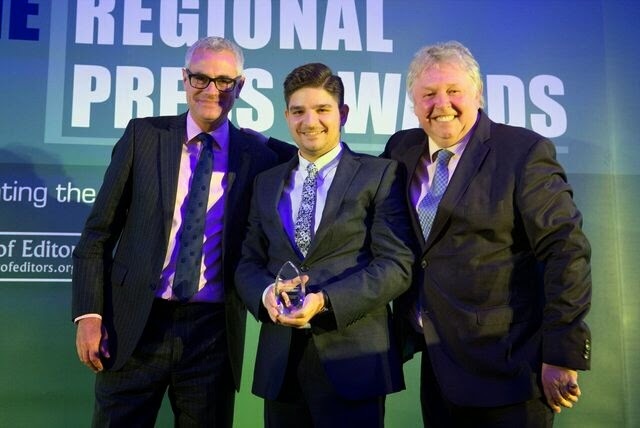 Special congratulations to Paul Dent-Jones who has continued the success story at the Essex Chronicle, since his appointment as editor a year ago, by picking up Weekly Newspaper of the Year (circulation over 20,000). It is particularly rewarding to see my former trainees on the shortlists, especially when I see how far they have come. Sian David trained as a reporter at the Editorial Centre in Hastings years ago but was shortlisted for the design award for her quality work at the Bath Chronicle. It was good to catch up with her for a drink too. 9. The awards are not-for-profit. Anything left over after covering the costs goes to support the Journalists’ Charity. The table collection also raised £1,334 for the charity. Well done. It is something all journalists need to support. The details are here. 10. 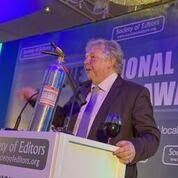 Presenter Nick Ferrari was once again a gem. He cracked on, ad-libbed, took the evacuation in his stride and made it all work. Well done Nick. Congratulations to all the winners and all of those on the shortlist. 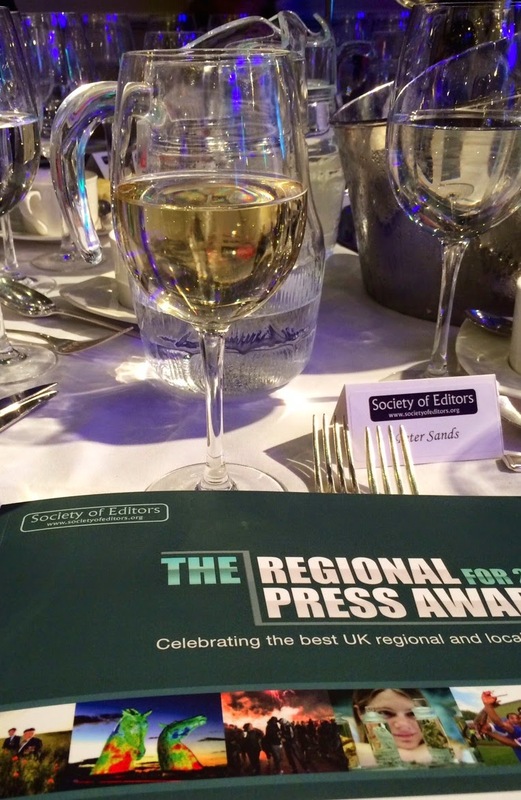 It is a fantastic achievement to be nominated, let alone win, and a reminder that regional newspapers are still delivering some excellent journalism. Finally well done Bob Satchwell, Paul Horrocks and the SoE team for keeping the whole thing together. Once again, a great job. Full detail of the awards are here. My old colleague Phil Lambell, a newcomer to the quiz, pitched in with the top score, 15, last week. Chris Lennon and Blaise Tapp both scored 13. The top team score was by more newcomers - Sunday Post reporter Janet Boyle and husband Alan MacDermid who clocked up an impressive 17. The veteran Batstone Collective (Adam and Lucy) scored 13. Here’s this week’s effort. As usual there are 20 questions with five bonuses - so 25 points to play for. Let me know how you get on. 1. Who replaced Vince Cable as Business Secretary in the Cabinet? Bonus: What position was Hastings and Rye MP Amber Rudd given? 2. Prince Charles’s ‘black spider' letters were published after a campaign by which newspaper? Bonus: How many letters were released? Bonus: Prince Charles said in his letters that the welfare of what species should be a 'high priority’? 3. According to the head of the Bank of England, Mark Carney, what is a major reason that pay rises have been low for several years? Bonus: UK unemployment rates fell to 1.83 million in the first quarter of this year. These are the lowest figures for how many years? 4. Which two football teams reached the final of the Champions League? 5. In which city did an Amtrak train crash, killing at least seven people? 6. Jason Watkins won the Leading Actor award at the Baftas for his role in which TV drama? Bonus: Which award was won by Benedict Cumberbatch? 7. Thomasz Kocik has been charged with the murder of a woman whose body was found in a suitcase. Where was the suitcase discovered? 8. Why did Kim Jong-Un execute his defence minister with an anti-aircraft gun? 9. Tiger Woods and his long-term girlfriend have split, allegedly because of his cheating. What is her name? 10. Network Rail workers are to stage a 24-hour strike in a row over pay. When? 11. Boo and Pistol were threatened with deportation from Australia. Why? 12. Mary Creagh became the fifth person to do what? 13. Former PA Gilles De Bonfilhs accused Robbie Williams and his wife Ayda of what? 14. How many runs did controversial cricketer Kevin Pietersen score against Leicestershire? 15. Six men were arrested in Ireland after police discovered weapons believe to be part of a plot to kill who? 16. He called his guitar Lucille and was ranked by Rolling Stone magazine as the third greatest guitarist of all time. Who is he? 18. Who, according to Patrick O’Flynn, had turned into a 'snarling, thin-skinned and aggressive' man? 19. Tickets for which event, with a value of between £37 and £49, have been offered on the internet for prices between £161.64 to £2,646.24? 20. How many seats do the Conservatives now have in Parliament? 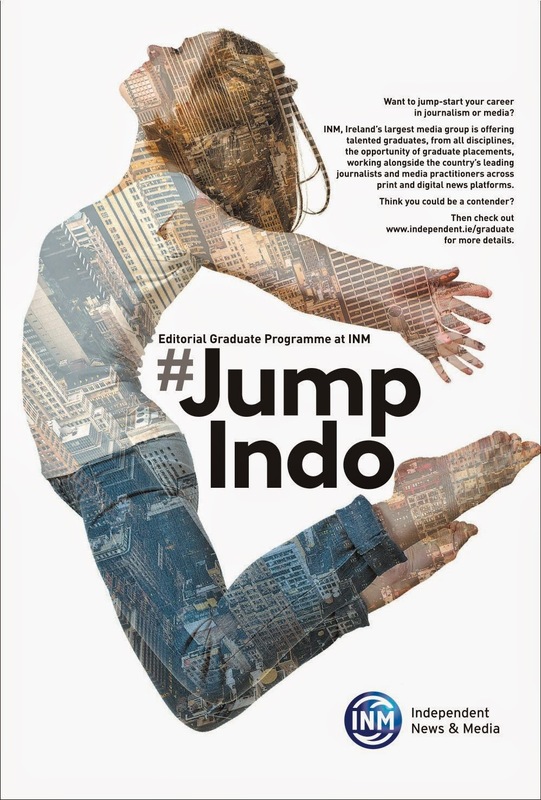 I am just back from Dublin where I have been talking about the Independent News & Media's Editorial Graduate Training programme which starts in July. Ireland's biggest media group is looking for graduates from all disciplines for its paid 12-month training scheme which will hopefully lead to a full-time role in the multi-media newsroom. But if you are interested in applying you will need to be quick ... applications close on Friday. All you need to do is send a CV, covering letter and samples of your work to graduateprogramme@independent.ie. You should also be passionate about the media, fascinated by the news, have excellent written and verbal skills and an understanding of digital and social media. Oh, and you'll need to be hard-working and innovative too. It's a fantastic opportunity with a great group that is developing as a vibrant print and digital business. You don't have to be Irish ... and Dublin is a great city. So if you are a graduate looking to jump start your media career this summer, this is quite probably the opportunity you've been looking for. Move swiftly and get your application in by the end of the week. Well done to joint top scorers Damon Wake and James Restall who both submitted scores of 16 in last week’s quiz. Alex Murphy (14) and Chris Lennon (13) also did reasonably well. Sophie Jamieson and Rozina Sabur scored a team effort of 15.5. I won’t embarrass the rest of you by publishing your scores! This week’s quiz inevitably has a political element to it … but there was a lot going on elsewhere too. As usual there are 20 questions, with five bonuses … so 25 points to be won. Let me know how you get on. 1. Former Shadow Chancellor Ed Balls lost his seat, who defeated him? Bonus: What is the name of the constituency? 2. Which of these is still a Liberal Democrat MP - Danny Alexander, Vince Cable, Ed Davey, Simon Hughes, Mark Williams, Charles Kennedy, David Laws? Bonus: What did Lord Ashdown promise to do publicly if the exit polls were correct? 3. The SNP's Mhairi Black became the youngest MP since 1667. Who did she win the seat from? Bonus: The SNP won 56 of 59 seats in Scotland. Who won the other three? 4. The highest profile Tory MP to lose a seat was the Employment Minister in the last Cabinet. Name please. 5. Houghton and Sunderland South was the first declared result in the election but which constituency was second? 6. What position does Charlotte Elizabeth Diana hold in the succession line to the throne? Bonus: How heavy was she at birth? 7. Who said: 'The dogs bark and the caravan goes by’? 8. She started her illustrious writing career as a reporter on the Chigwell Times but was sacked after reporting on a tennis club dinner that she had failed to attend so failed to notice that the after-dinner speaker had died halfway through his speech. Who is she? 9. Ofcom announced an investigation into which word used by Jeremy Clarkson on Top Gear? 11. Why was Pamela Geller in the headlines? 12. Ian Walters was jailed for life for murdering his wife. How did he do it? 13. Which city’s airport was closed due to a fire in the terminal? 14. Who has been found guilty of culpable homicide of 38-year-old Ullah Khan in 2002? 15. Who is headlining Glastonbury on the Sunday night this year? 16. Forbes released its list of the World’s Biggest Public Companies, which country has the top four? Bonus: The top British company on the list was 15th. Which company? 18. Entrepreneur Dave Goldberg, who died following a fall on a treadmill, was married to the chief operating officer of which company? 19. Underwater explorers in Madagascar say they have discovered treasure belonging to whom? 20. Former England manager Graham Taylor denied allegations that he was put under pressure to limit the number of what? So here we are. After all the squabbling, the nastiness, the madness, the TV debates, the propaganda and the fluctuating polls … the day has finally arrived. 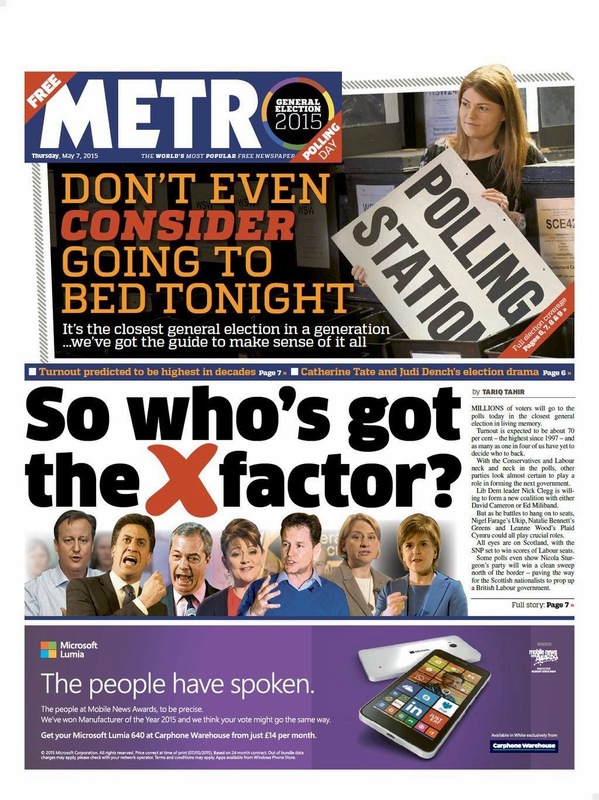 And our newspapers have one last attempt to persuade you to vote. There are no real surprises. 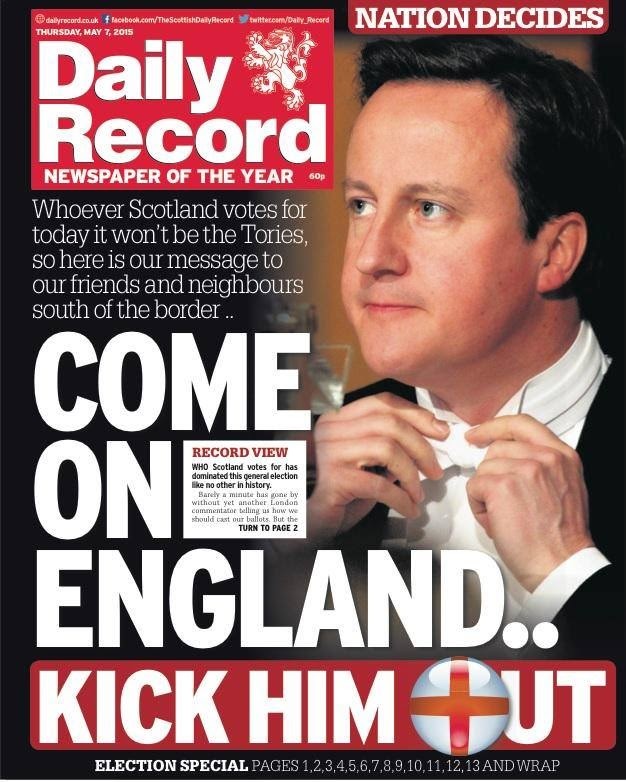 In the red corner there is the Daily Mirror and it sister paper in Scotland, the Daily Record. 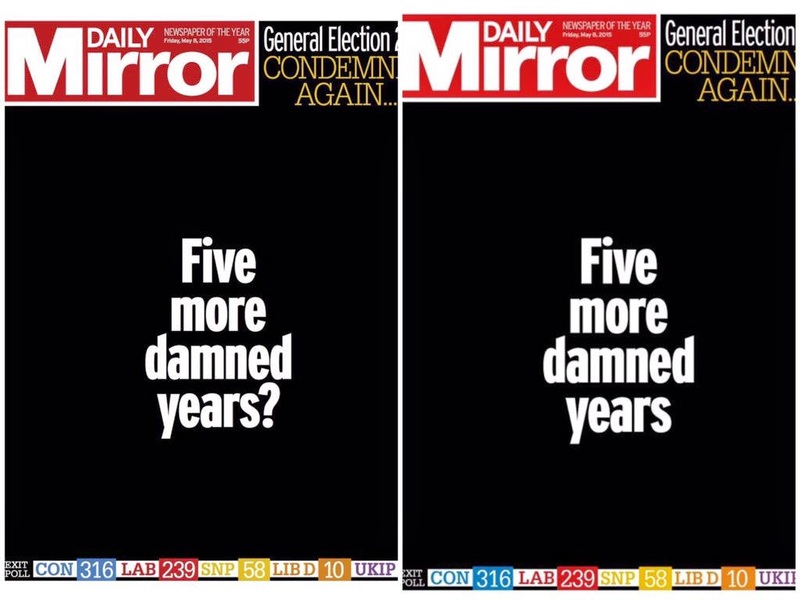 The Mirror, of course, has a proud tradition of supporting Labour and of strong election day pages. It doesn't disappoint today. 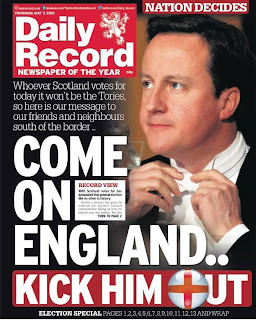 The Record leads with Come on England for probably the first and last time in its history. 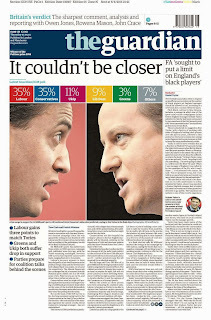 Also in the reddish corner is The Guardian but its front page plays a straight bat today. 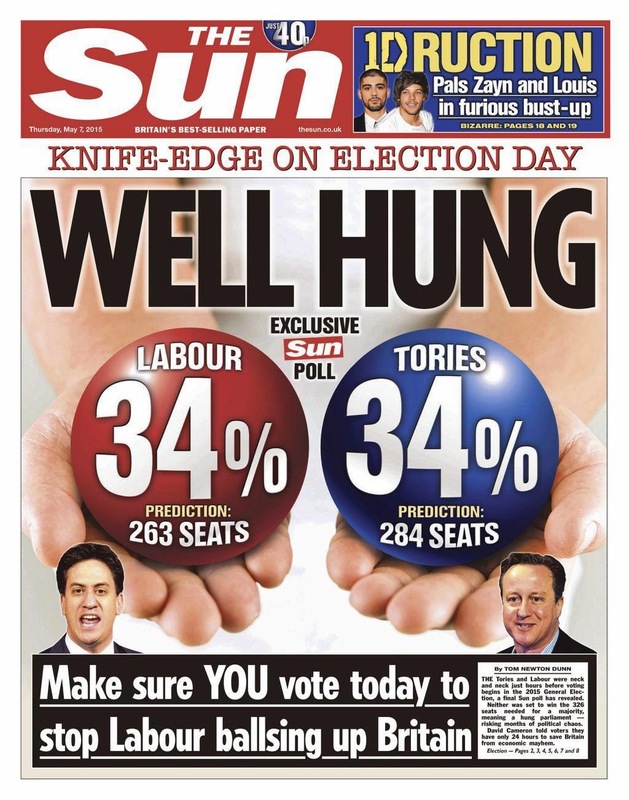 It gives prominence to its own poll showing the Tories and Labour neck and neck with 35 percent each. The face off between Miliband and Cameron is nice ... note Ed is on the left, Dave on the right. In the blue corner is The Sun. 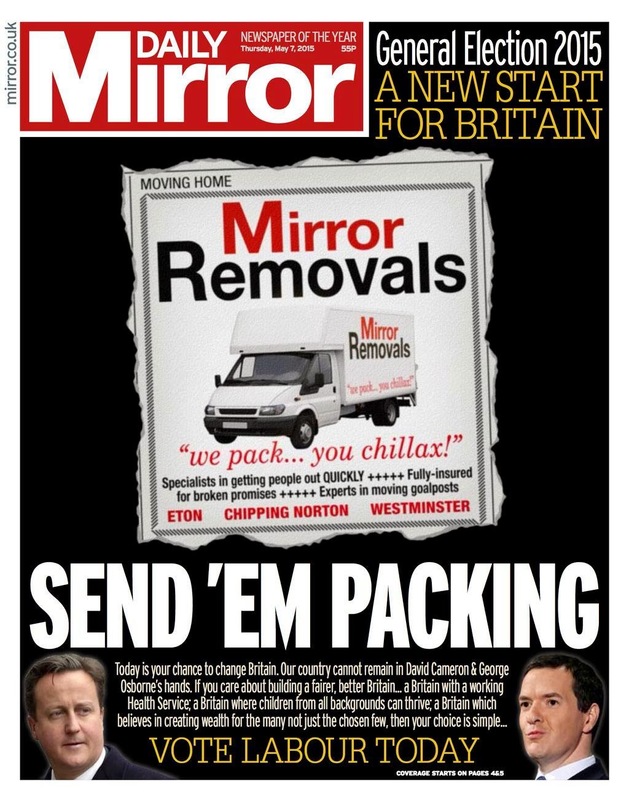 Long gone are the days when Rupert Murdoch gave his blessing to Tony Blair's Labour. 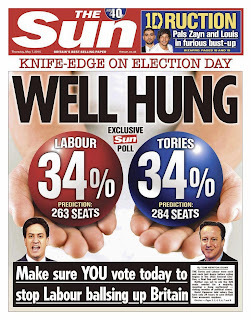 It is a good old innuendo front page - although the balls aren't quite as balanced when you look at the seats. 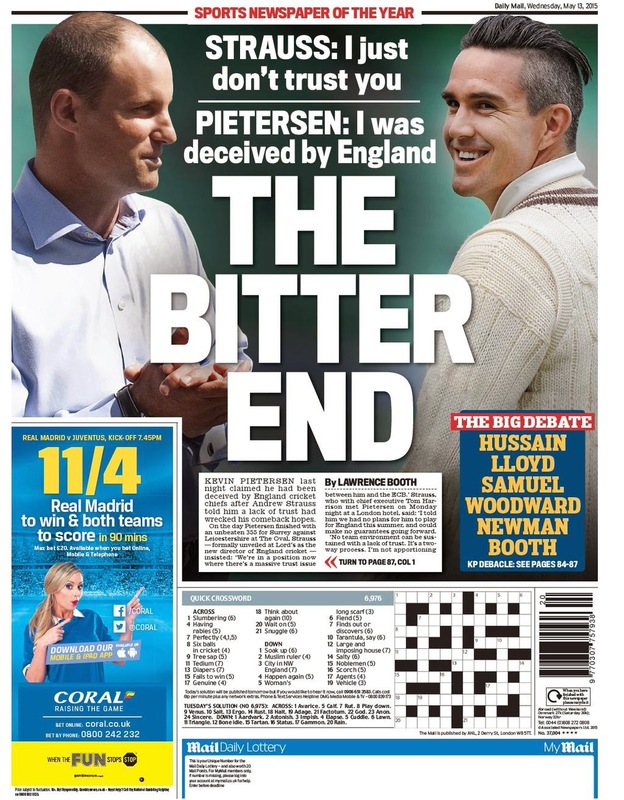 Initially it looks like a neutral front page but the message to readers across the bottom is unequivocal. 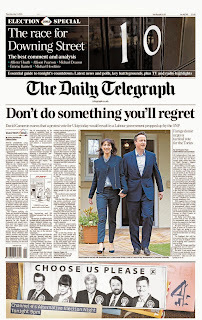 Also in the blue corner is The Daily Telegraph urging its readers not to do something they will regret. The words actually belong to David Cameron but the message is clear. 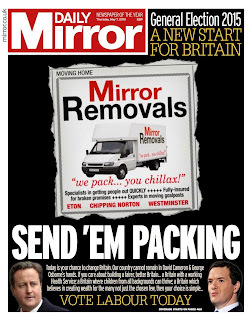 It uses a picture of a casual Sam and Dave in matching Tory blue suits. Should we be voting for a male Prime Minister who doesn't wear a tie? Perhaps we should organise a poll. 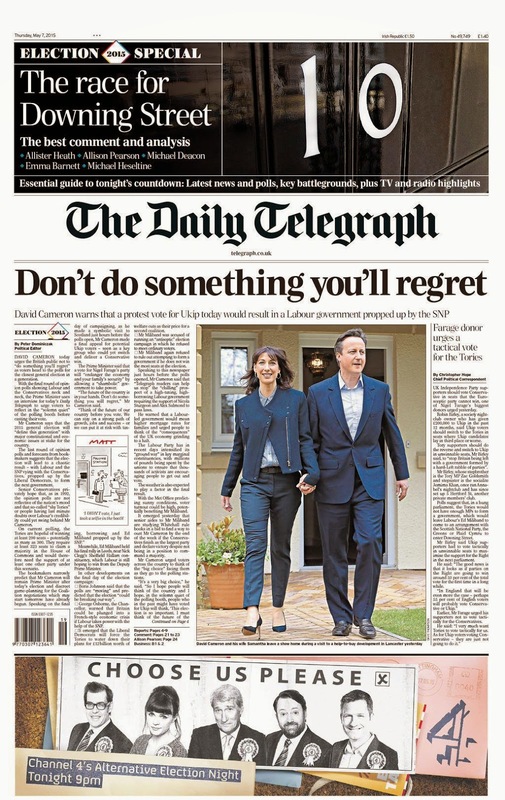 The Daily Mail, which uses the same picture as The Telegraph, is the only paper to not to splash on the election. That said, it's message is as strident as it can be. 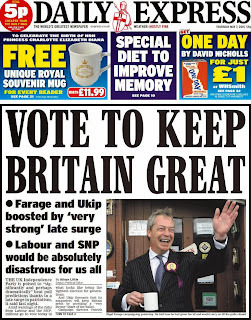 In the purple corner is the Daily Express. Owner Richard Desmond has thrown his weight behind UKIP with a £1million donation and there is no way his title is backing down at the final hurdle. 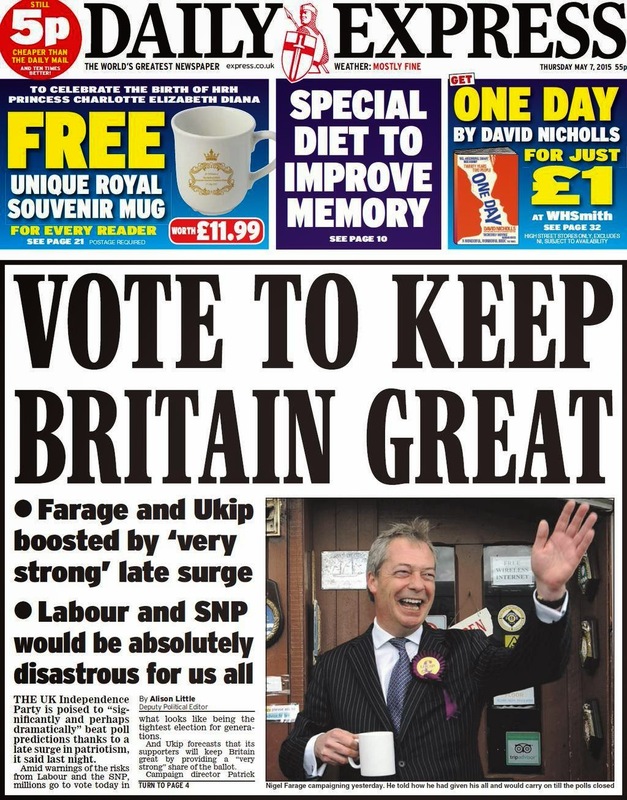 The Express features Nigel Farage as its main picture. 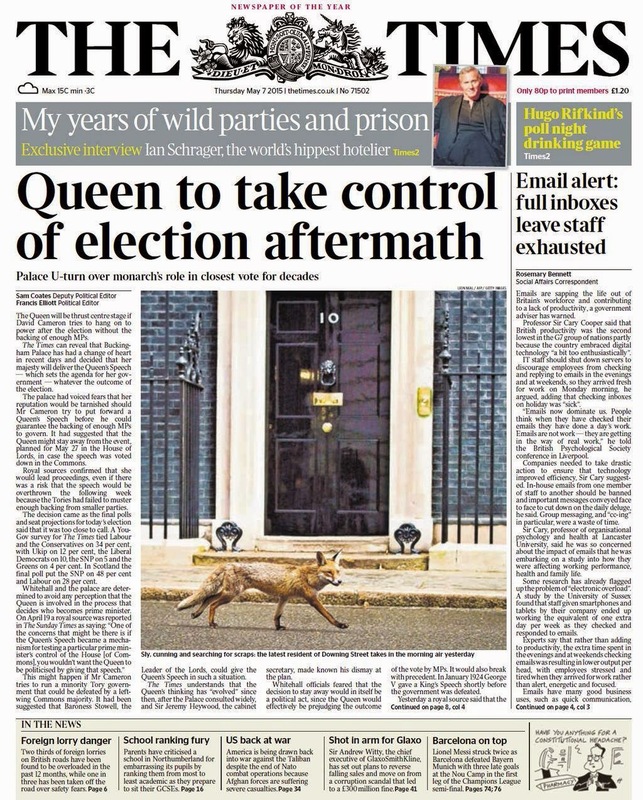 The Times, traditionally in the blue corner has moved to a more neutral front page putting the Queen in the centre stage and exploring what will happen if it's too close to call. If that picture really was taken yesterday morning, it is quite brilliant. 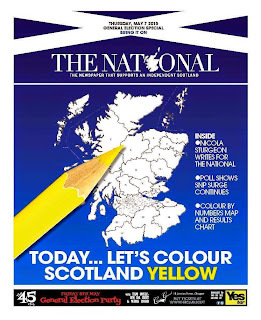 In the yellow corner is The National which apparently wants to turn all of Scotland Liberal Democrat. Must be big Danny Alexander fans. Surely some mistake. The SNP of course also sports yellow (and black) as its colour and that's where the paper's heart really lies. One of the most creative pages of the day. 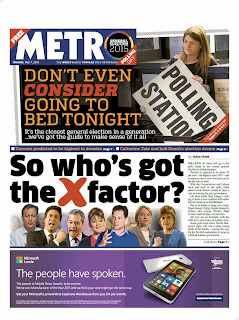 In the neutral corner, Metro shows a nice touch with its X factor front and advice not to go to bed. 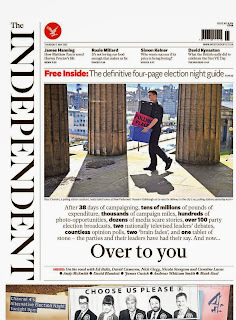 The i and The Independent play it as straight as they possibly can, simply urging readers to vote. 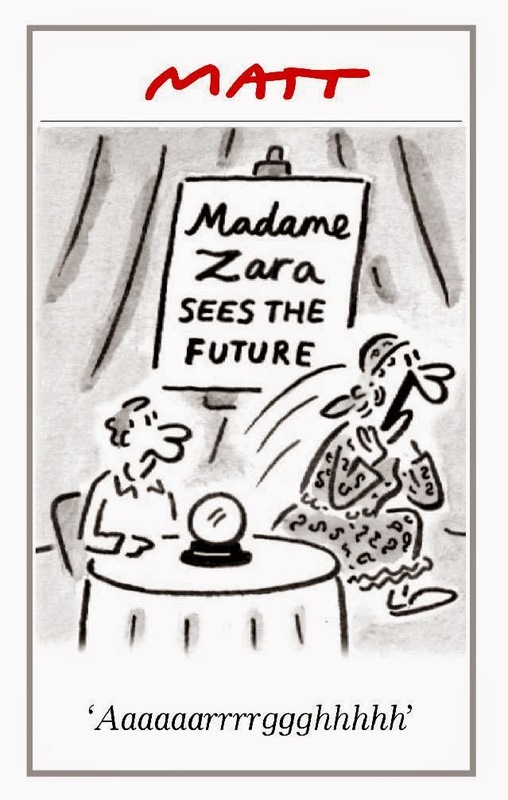 And finally here's Matt, bringing a touch of reality and his usual brilliance to the party. So there you have it. 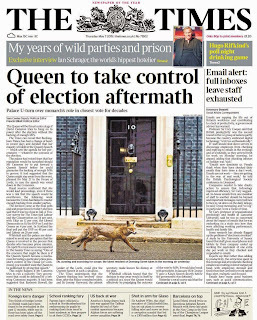 The papers being partisan, which is their absolute right, and enjoying a final flurry. 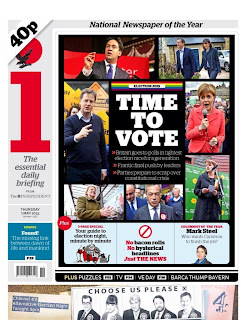 There is barely a mention of Nick Clegg who, this time five years ago, was the main man. Anyway, don't forget to vote. I am in Dundee today and tomorrow morning I will be in Dublin. Tonight, though, I will be in Sussex in time to put my X in the box. Stick that up your rocket, Russell Brand. I first visited the Bishop’s Manor in Howden in 2003. The Press Association had won the contract to train the Daily Mail’s subs - a pioneering scheme which involved taking youngsters from journalism courses and turning them into national newspaper sub-editors. PA needed help with the training and Pat Pilton, who I had worked with at the Mirror five years earlier, asked me to lend a hand. Instead of running the course in London, the training was to be in East Yorkshire. PA had taken over the town's manor during one of its acquisitions and it had become its Northern outpost. When the operation got too big for the manor, PA moved around the corner and took over the old police station and magistrates building. The manor was empty - and made an ideal training centre. It was kitted out with lecture rooms, Macs and PC suites, the latest publishing software, plasma screens and later came a technology and video suite. With its history, its thick stone walls and big creaking wooden door, the 12th century building became a place where the past and the future met. It was simply a great place to train and to learn. The Mail’s subbing course has continued every year in the manor since then, with myself and Mike Watson being the ever-present trainers. The building also hosted training schemes for MailOnline, The Daily Telegraph, The Sun, Al Watan (a Saudi newspaper) and PA itself. Senior training courses for newspapers in the North were also held there and I redesigned many newspapers on the manor’s computers. For a few months each year the Manor was my home, as I lived in one of the two flats on the top floor. Hundreds of today’s national newspaper journalists have passed through the manor and many editors and executives have visited. They are in good company. In days gone by at least three kings also stayed there. Edward II, Henry V visited and King John spent the Christmas of 1211 there. But, as I have long learned in the newspaper game, nothing lasts forever. 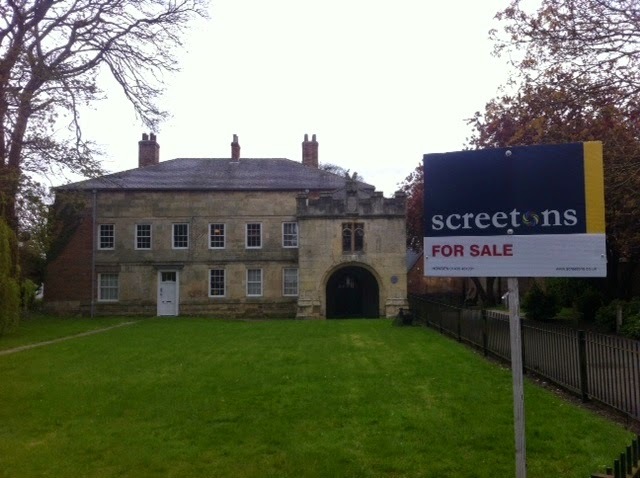 The manor is now surplus to requirements and is up for sale. There is plenty of spare space in PA's main operating centre which will house a state-of-the-art training centre. It will be first class and the Mail subbing intake for this year is already destined to go there in September. So Howden will continue its tradition of hosting the newspaper stars of the future. They will continue to do the quizzes in the White Horse and Wellington, enjoy the cheap curry nights at the Zolsha and get the best fish and chips from the Minster Fish Bar. Closing the manor undoubtedly makes enormous sense ... but it is a little sad nonetheless. In the great scheme of things the last 12 years are just a small part of its amazing history. But for me, and many others, they were hugely significant. Last week's quiz was apparently a tough one. Congratulations to Chris Lennon who scored a personal best and got the top submitted score with 16. Alex Murphy recorded 13 while the Batstone Collective (Adam and Lucy) only clocked up 14 as Lucy was distracted by the London Marathon. Here's this week's quiz. As usual there are 20 questions, with five bonuses. So 25 points are up for grabs. Let me know how you get on. 1. On the BBC Question Time leaders’ special David Cameron said he was sticking with a target of below what figure for net immigration? Bonus: Audience member Catherine Shuttleworth told Ed Miliband: 'If he worked in the corporate world he would have been fired and he wouldn't have been allowed back to that job.' To whom was she referring? Bonus: In which city was the programme held? 2. Andrew Chan wore a Penrith Panthers rugby league jersey for what event? 3. What, according to Jeff Mostyn, is 'the greatest fairy tale since Hans Christian Andersen wrote his last one.’? 4. A former Portuguese police chief was ordered to pay the parents of Madeleine McCann how many euros in libel damages after accusing them of faking their daughter’s abduction? 5. Why was Poppy Smart in the headlines? 6. Which company is the new sponsor of the FA Cup? 7. Labour’s Andy Burnham admitted that what legislation, introduced by the Labour Government in 2008, was a mistake? 8. Why was Toya Graham dubbed ‘mum of the year’ by Twitter? 9. David Cameron vowed to introduce a law guaranteeing no rise in income tax rates, VAT or national insurance for how many years if the Tories win the election? Bonus: Ed Miliband appeared in a video saying 'I'm not sure I'd look so good with a pint on my head’ Who was he talking to? 10. The Nepal earthquake had a Moment Magnitude Scale measuring what? 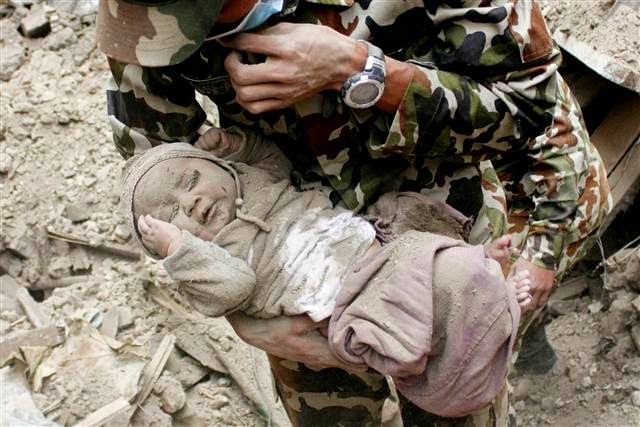 Bonus: How old is Sonit Awal who was pulled to safety after being buried under a collapsed building for 22 hours? 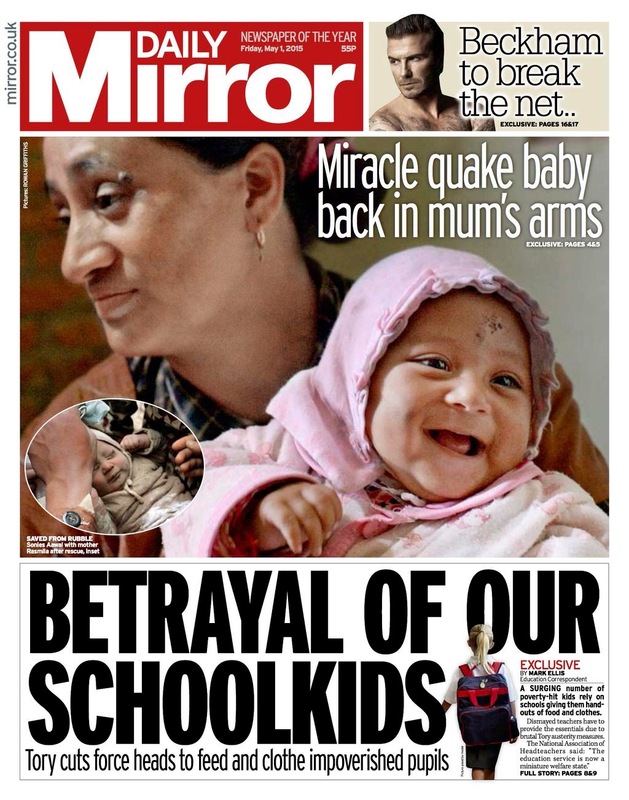 Bonus: The first British flight back from Nepal, which brought 120 Britons home to Stansted was chartered by the DFID. What do the initials DFID stand for? 11. What did cartoonist Renald ‘Luz’ Luzier say no longer interested him? 12. Who is to replace Nick Hewer on the BBC’s Apprentice? 13. Who was described in a Daily Telegraph obituary as 'a falsetto-voiced incontinent green waterfowl’? 14. All four semi-finalists in the World Snooker Championship are from which country? 15. The trial of James Holmes began this week. What was his crime? 16. Nigel Farage reported the BBC to Kent Police after being mocked on which television programme? 17. Name the two boxers who will be fighting in the $300 million Fight of the Century in Las Vegas this weekend. Half point for each. 18. Which company says it will file a criminal complaint over allegations that German intelligence helped the US carry out industrial espionage? 19. Nasa space probe Messenger crashed into which planet? 20. Apple said some of the functions on its new watch may not work properly when it is worn over what?